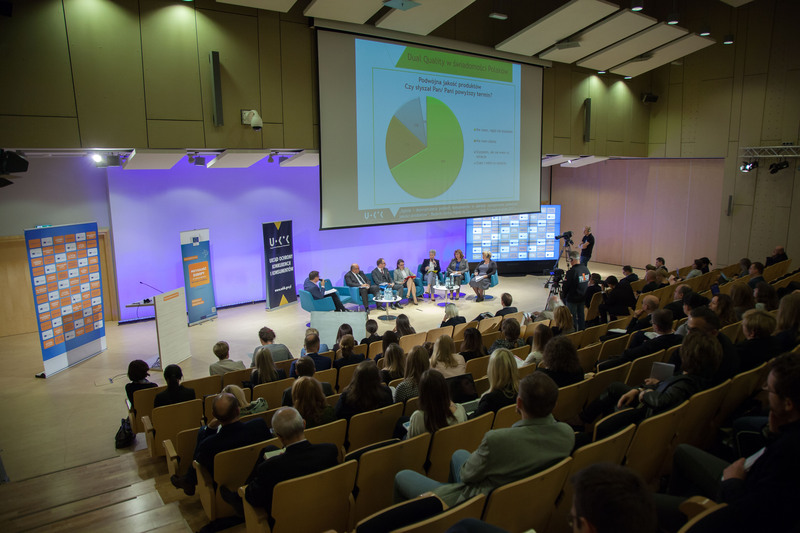 The Citizens' Dialogue on the New Deal for Consumers travelled to Poland on Thursday, October 18, in what turned out to be a lively debate on the future of consumer rights in Europe. For the past five months, the Commission’s Justice and Consumer officials have been travelling Europe, in an effort to listen to consumer stakeholders in Member States and present the goals of the New Deal for Consumers. Vera Jourova, European Commissioner for Justice, Consumers and Gender Equality, has been fighting the company at the centre of the "dieselgate" scandal, over its refusal to compensate EU customers despite doing so in the US. The episode, along with others such as airlines mass cancellations of flights, has cpmfirmed Brussels’ view that the EU lacks the legal armoury to tackle cases affecting large numbers of people in multiple countries. Gathering in the Polish capital, Warsaw, representatives of consumer rights groups, business representatives, the European Commission, and entities from Poland's central and local government exchanged views on the new legislation being proposed. Polish consumer protection law is already strongly influenced by the legislation of the European Union and thus it is based on common European principles which intend to protect consumers from unfair or misleading practices. In her keynote speech, Dorota Karczewska, Vice-President of the Office of Competition and Consumer Protection, said Poland was happy to continue to follow the Commission's lead in regards to consumer rights. "If we look back, we've had a number of negative events in which entrepreneurs who wanted to be competitive engaged in unlawful behaviour," Ms Karczewska said. "Therefore Poland is quiet happy in taking the recommendations by the Commission included in the New Deal for Consumers." Alexandra Jour-Schroeder, Deputy Director General of DG JUST, described the New Deal not as a revolution but "a necessary evolution." "What we want to do with this New Deal is to bring better private and public enforcement of our consumer rules," Ms Schroeder said. "The rules need to be modernised in line with market development s while at the same time reduce disproportionate burdens on traders." Poland has seen its economy expand faster than that of any other EU nation since it joined the bloc in 2004. The country was the only EU member to avoid recession as a result of the global financial crisis and is today the eighth-largest EU economy. Under the New Deal for Consumers it will be possible for a qualified entity, such as a consumer organisation, to seek redress, such as compensation, replacement or repair, on behalf of a group of consumers that have been harmed by an illegal commercial practice. Although welcomed by most Member States, the measure has been a sticking point for some who fear it will open the door to a US class-action style system. Kamil Pluskwa-Dabrowski, President of the Polish Consumer Federation, said what the Commission is proposing is entirely different. "As of today there is no connection between the two procedures [injunction and collective redress]," Mr Dabrowski said. "Right now in Poland we have an entirely different system in terms of those injunctions phase. The question is what happens further ahead both with individual and collective claims." Lidia Persson, Head of Unit in Collective Consumer Interests Protection's Department (UOKiK), brought attention to how citizens' data is handed when they use online platforms. Ms Persson reminded the audience that in today's world data has "real value" and should not be given away for free. "We support the changes the Commission wants to bring forward in this area," Ms Persson said. "There needs to be greater transparency in the use of commercial online platforms." UOKiK also expressed support for the “harmonization” of penalties, and the creation of more efficient practices that better protect consumers. "Consumers are exposed to permanent and more refined infringements and they need better protection and better instruments to make their rights respected," Ms Persson said. As the Consumer Dialogues approach their final stage, preparations are being made for a November 28 meeting with stake from all Member States in Brussels. The goal is to iron out any differences of opinion on the package before it moves on to the final negotiations in the European Council and European Parliament.